Václavské Náměstí, Prague’s modern square is a gritty mix of shopping and tourists, dabbed with history. Finding a good bite and beer is perplexingly not the easiest of tasks. Four notable breweries reside in New Town. U Fleků, the only brewery in central Europe to be brewing continuously for 500 years, serves exceptional dark lager and gives a great historic brewery tour; Novoměstský Pivovar brews light lagers, Ferdinand has a flagship restaurant, and U Medvídků is known for their strong lagers. Just on the edge of the center, you’ll find Nota Bene, a modern restaurant serving cuisine made from farm fresh ingredients with 6 notable beers on tap. Just down the street is Aliance P.I.V member Kulový Blesk, with 14 taps that keep up with the newest beers from noteworthy Czech brewers. If dining on the finer side of things is up your alley, Sansho makes a fantastic menu of Asian fusion cuisine, and Čestr serves Pilsner Urquell and steaks to perfection. Náplavka, on the stretch of river bank from under Palackého Bridge along Rašínově Nábřeží, is lively river-walk, hosting events and a farmer’s market, and home to Bajkazyl, a DIY bar/bike shop. 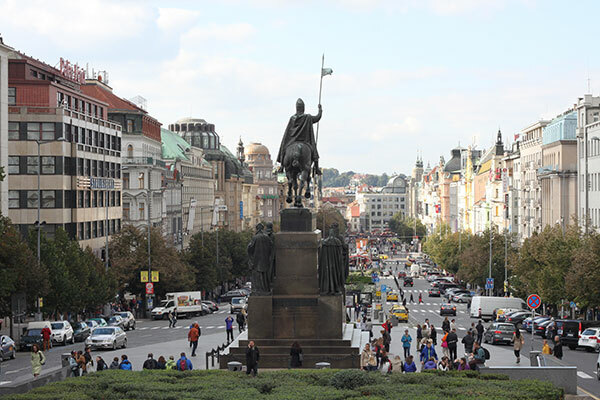 Surrounded by the old castle walls, the fortress of Vyšehrad overlooks the Vltava, complete with a beautiful church, park, a few restaurants, and a beer garden. One of the most pleasant places for an afternoon stroll.